I am a Singaporean-born, Hong Kong-raised, Paediatric doctor undergoing my first MSF mission in Gogrial, South Sudan. Currently the MSF hospital here is the only healthcare facility in the Gogrial area; providing emergency and maternity services, paediatric intensive care, paediatric primary care, and a therapeutic feeding centre for malnourished children. South Sudan is a country still suffering from civil strife. Health problems manifest at the end of a complex, and sometimes violent, socio-economic-political-geographical chain of survival. Struggling to provide healthcare here where the population has absolutely nothing – no food, no water, no education, no infrastructure, no security - is often heartbreaking; but I hope to share what amazing work MSF can still do here with limited resources, creativity and passion. I am truly grateful for your interest in joining us on this challenging and emotional journey, and for your enduring support of our work with MSF! I’m standing on the burning airport tarmac in Juba, the capital of the world’s newest nation, South Sudan. We are a sombre and sweating group of humanitarian workers from every NGO on the planet, hitching a ride on a small World Food Programme (WFP) cargo jet, to projects in every corner of the country. These are the only planes carrying aid workers, an after-thought in a country where monstrous boxes of food and medical supplies rumble by us on huge trucks, ready to be loaded for distribution. Juba serves as the main chaotic entry point for tens of thousands of humanitarian workers pouring into one of the world’s poorest countries. Planes full of aid workers nod grimly at each other as they board in Paris, Brussels, Amsterdam and Addis Ababa; identifiable by the tiny red organizational logos on their clothing and bags. They are unperturbed by the swirling chaos of movement in Juba airport all around us. "Once you have seen South Sudan, you have seen it all," a Dutch aid worker murmurs to me. Row after row after row of towering white cargo planes emblazoned with UN, ICRC (International Red Cross), Médecins Sans Frontiѐres (MSF), World Vision, WFP Logos glisten in the sun, stretching as far as the eye can see. The horizon wavers and stutters in the heat, vapours shimmering off the red dust of this earth bowl, blurring the planes into the shadows of savannah palms. But this is no mirage, in the country where the Blue Nile meets the White Nile. Camouflaged army units are scattered between the planes, and SPLA soldiers lean against their tanks shouldering kalashnikovs, eyeing the assembly line warily. Photographs are completely forbidden in these sensitive security areas, and my mind quickly quashes the memory of other visitors hostilely reprimanded and interrogated, for the innocent mistake of taking out a smartphone on arrival. This African sun at the equator is a scorching and unforgiving 50 degrees celsius, but it’s not the sweat dripping down my face that bothers me. My eyes well up with fat tears as I stare at the harsh enormity of the situation here, and the need for so much food and aid is heart wrenching. This is a country that after 50 years of fighting and 5 years of achieving independence, is still in the midst of civil war and strife. It still has no way of sustaining the survival of its own 12 million people, displaced internally and starving. A state entirely dependent on humanitarian aid, and with no means or tangible resources to stimulate independent growth. I am a Paediatrician-in-training born in Singapore, working in Hong Kong, on my way for my first MSF mission in Gogrial, the former capital of Warrap state. 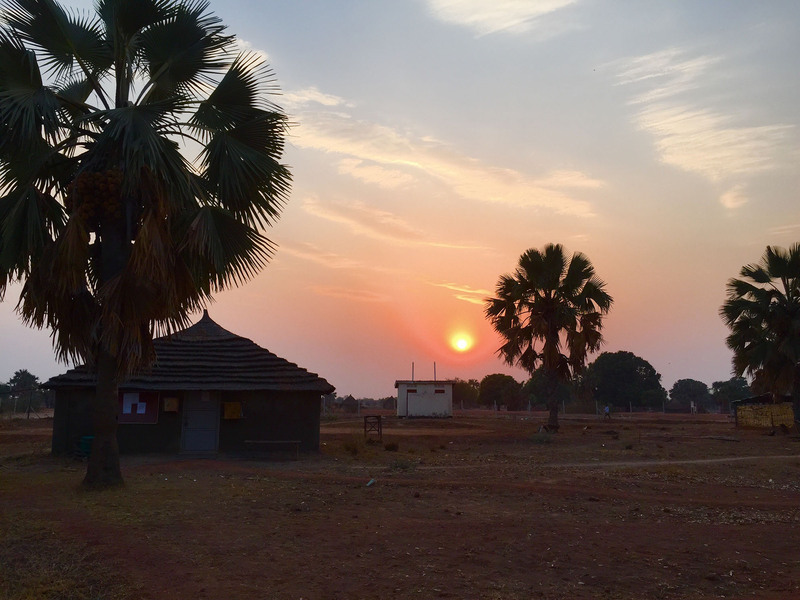 It is a very remote location in the northwest corner near the border with Sudan, where MSF planes deliver medicines, supplies and food to us once a month. My life for the next 9 months has been packed into only 2 rucksacks weighing less than 25kg (the humanitarian limit, as weight must be allocated for medical supplies and food). So many things deemed unnecessary for my survival were discarded. But the people here walk for days with very much less, completely terrified, just to reach food, water, safety. My heart was carefully packed and re-packed into these bags with a heightening sense of despair, my life in total upheaval and turmoil just to get here; but hardly a comparable parallel microcosm for what the people of this country have experienced. The 10 years it took for me to even qualify for a seat on this plane - of hard work, of heartache, of overcoming obstacle after obstacle for me to live this dream – pales in comparison to the suffering of this country, magnified over decades. Now that I am finally here after so long, perspective assuages the memory of personal trials and tribulations. I am already suffering the aftershocks of my humanity and empathy being confronted by everything I see here. Originally occupied by Egypt then jointly governed with the British in colonial times; the territories of South Sudan and the northern Republic of Sudan achieved independence in 1956. However the majority Muslim North and the majority Christian South had already started to erupt into civil war as independence from the British was being finalised; over issues such as historical enslavement of the Southerners (for whom embracement of Christianity became a reactionary and empowering national identity); deep ethnic and tribal divisions, conflicts over natural resources and oil at the border. After the two Sudanese Civil Wars from 1955-1972 and 1983-2005, South Sudan became independent after a referendum with 98.83% vote in July 2011. However in a country where over 60 different tribal languages are widely spoken, violent internal political and ethnic conflicts have continued, despite a peace agreement that was signed between President SalvaKiir (Dinka tribe) and vice President Riek Machar (Nuer tribe) in August 2015. The country is tense, holding its breath as economic instability has led to sky high inflation, threatening to undermine this tenuous ceasefire and dissolve it into volatility. The night before my flight, I lay awake in a capital city where random gunshots still sounded throughout the night, plagued by the gnawing fear that I don’t know enough to serve these long suffering South Sudanese people the best that I can. I am still paralysed by the knowledge that the context, diseases, patients and healthcare resources will all be so vastly different from what we see back home. I thought insomnia was bad, when I was on-call in a first world hospital waking up every hour to check on my preterm newborns in the intensive care unit, even knowing they had expert and dedicated nursing care. We would hover above their tiny hearts, imagining the flutter of their premature minds, wondering how much they felt the pain we caused them, just for the sake of prolonging life. Miracles would prove us and science wrong, ironically pushing us to be even more ruthless in pursuing a good outcome, when there wasn’t always a guarantee. All the cycles of life and death, ebbed and flowed through time and space and experience. Now performing resuscitation will be mostly futile because there are no tubes to intubate the airway, no ventilator machines, no special infusion drugs to make their hearts work. How do you offer optimum medical care without options of resources and technology, that you know in any other setting could have given babies their best chance to thrive and grow? How does a doctor learn to let babies go due to circumstance? And ultimately, there is the heartbreaking knowledge that you are going to let them down despite what you do, because Gogrial is now a relatively conflict-free area, and with limited resources we have to close down and redirect our focus to other projects. MSF is an emergency-response organization. Crisis management, and not development, has always been our mandate. But there are barely other NGOs in Gogrial yet with long-term projects. The future is still so unclear. Who will be there for them when we go? Can we find someone to take over the project? The plane soars over large swathes of red clay, and uninhabited stretches of arid desert shrubbery. The man sitting next to me is a Dominican agriculturalist, and points out tiny villages in the distance, lined with simple but quaint mud huts and their thatched straw roofs. Giant palm trees stretch their stiff green fingers up towards the African sun, ripe and heavy with yellow fruit. This is a fertile land after the monsoon rains, he says. He tells me about how he is teaching small communities in Rumbekto plant sesame seeds and okra; and how he is showing them how to use an ox-plough to turn the soil, instead of just keeping herds of cattle as traditional marriage currency. He explains how NGOs are digging bore holes, where the water is only 4 metres below the surface and can be used to irrigate fields. His gravelly voice weaves together fragile puzzle pieces of optimism, as we glide dreamily through the stratosphere above this very broken country. On landing, we descend back into the shock of fiery heat, and clasp each other’s hands tightly in silent understanding. I shoulder my heavy bags and begin the long and lonely walk of baptism, across yet another mile of landing strip covered in aid organization planes. South Sudan has ravaged itself. After struggling for so long to finally get here to this landscape of brutality and humanity, my presence feels like nothing more than a glaring reminder of unmet and enormous needs. I think of my extremely worried and elderly parents back home watching me disappear into this world they will never understand, helplessly turning their crying faces away as we said goodbye, my mother clutching at my father’s bowed back for support. Their only daughter, given all the opportunities to achieve Asian values of success and prosperity, raised with all the conventions of conformism to Asian decorum, now flying away into a country in the middle of civil war. As grateful as I am for the opportunity to be humbled and challenged by working with MSF, for the opportunity to follow my heart and know it will be broken completely, to choose to grow... this has been the most selfish thing I have ever done. I swallow the seeds of consternation, trepidation and guilt with every step, feeling more alone and lost than I have ever felt in my life. There is no real terminal, just a shouting crowd around a small collapsing shelter. Look for the man with the MSF jacket, they told me. Jamie, our driver appears out of clouds of dust like an exhalation of relief, cradling my small hands in his large ones, with an easy smile and loping gait. His six-foot-four wiry frame easily towers above me, as his eyes crinkle with sun lines and a genial toothy smile at how I have to lean my head far back to look up and thank him. He keeps up the chatter on the 4 hour drive, teaching me words in Dinka (the majority population and dialect in this state), and entertaining me with stories of previous expat healthcare workers from all over the world, that shared with him quirks of their cultures. Signs in Arabic script are still everywhere, reminders of an imposed past. Dissonant rhythms of Arabic music on the radio punctuate every pothole and painful bounce in this land rover, struggling against the friction of unpaved dirt roads. "When the rains and muds come, one cannot get anywhere," he tells me gravely, "not even our ambulances." We stop at a roadside stall, and ladies in colourful neon robes bring us hefty beer mugs filled to the brim with the sweet juice of mangoes. Painfully thin children crowd the car in fascination and press their fingers against my window, shouting, "Kawaja!!" White person! But equally many malnourished women in tattered clothing, clutching bony and sickly frail babies covered with flies, reach their withered hands out to me, palms up, in a universal plea for help. Some reach in through the small gap, to grasp desperately at my clothing. Frail men blind with cataracts they cannot afford to have treated, shakily stumble through the market. Paralysed and amputated teenagers shout at us as they are pushed by in makeshift wheelbarrows. "We cannot give money to them all," Jamie tells me and shoos them away, as my hand freezes in my pocket, reaching for nothing I could give that could even possibly help. As we pass villages burned to the ground with remnants of wood and straw scattered to the winds, his eyes darken into a glare, lips pressed into a thin line, gripping the wheel with white knuckles. "What is your country like," he asks me. "How is your home?" I hesitate, and think about our skyscrapers, and the crowds of multicultural people that brush past each other and co-exist in an alienating kind of harmony, and the painful waste of such an abundance of food. He switches off the radio and waves one hand at the desolate grassland all around us, where the people fled to hide in the bush when the enemy came hunting. They used to hide for days up to their necks in the swamps. But the rains came late last year, and now nearly every water source including the river, has evaporated. Bone-white branches of naked trees stretch their thirsty arms out in all directions, plunging again and again back into the clay soil, roots searching and searching for water. We are so near the border with Sudan, the second hottest country in the world after the deserts of Libya, with daytime temperatures of 50-55 degrees Celsius. Stick-thin people languish together exhaustedly under giant mango trees like piles of bones, seeking temporary relief from hunger and sweltering heat. "Is there war?" He asks with a hard voice. "Do your people kill their own brothers?" I look at the matchstick silhouettes of so many barefoot South Sudanese men, women and children walking on the road; vanishing and re-appearing through eerie billowing clouds of ochre fog, as our van ricochets past them. Just a year ago here, enemy tribes intent on slaughter appeared in the same horrific and fearsome manner on this dust road. All around the country, they are walking wearily or running for their lives, without possessions or water or food for day and days, just to get somewhere. These people are possibly en route now to our hospital as it is the only one in the whole region, but we cannot stop to pick them up. There are security protocols in place, and some teenage boys still wear oversized uniforms on their hollow frames, swinging their rifles threateningly. A macabre imitation of children playing dress-up with inherited clothing, but here generations of children have grown up playing games of war. "No," I say quietly. "Not like this. But we have been lucky to have peace for many years." "There can be no peace here," he tells me. "We are not farmers, we do not wait for seasons to change, or for the rains to come to us. We are warriors, a hard people in a hard land, and we fight to take what we want and what we think we deserve. This has always been, and always will be, our way. We are ready to fight and ready to die, and human life is of little value. " I bite my lip until it bleeds, the suffocating storms of blood-red dust filling my lungs, pulse hammering on my temple. We drive on in silence, until we reach the huge metal gates of our compound emblazoned with the MSF logo. “We’re here,” he breathes, and lifts me out of the land rover. The MSF expat team are in the middle of a medical meeting under a giant acacia tree, backlit by the brilliant violet and pink glows of the setting sun. Beaming smiles turn to face me, as I am ushered to a seat and handed a walkie-talkie. We talk about infection control, the quality of our services and how to improve them, about human and medical resource challenges for the future, about plans for training staff in the months ahead. Thoughtful strategizing and optimistic passion drives the debates, and the heavy ashes of the day finally resettle in my heart. "Welcome to MSF Gogrial Paradise," the other doctor winks at me. "Welcome home." Disclaimer: The content above represents the personal opinion and experiences of the author. Any similarity to persons or events, living or dead, represents pure coincidence. The names of all parties involved have been changed to protect confidentiality.